Moderated by former first daughter Chelsea Clinton, the panelists included Rabbi Marc Schneier, co-founder of the Foundation For Ethnic Understanding, which fosters “twinning” programs between mosques and synagogues and Imam Shamsi-Ali, the spiritual leader of the Islamic Cultural Center of New York and the chairman of the Al-Hikmah mosque in Astoria. Holding aloft signs and banners reading “What Are Muslims Doing for Peace?? ?”, “Burning Churches, Honor Murdering Women. Where is the Muslim Protest?”, “Sharia Equals Death”, “Since 9/11, Radical Islamists Committed 11,961 Attacks, Killed 75,038, Injured 115,255”, “Wake Up! 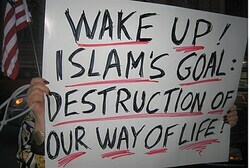 Islam’s Goal: Destruction of Our Way of Life”, “Stop Billions of Saudi Oil Monet Funding Worldwide Radical Islamic Intolerance and Terror”, “The Right of Jews to a Jewish State in Israel,” “The Right of Muslims to Convert to Other Religions,” the protestors took aim at what they perceived to be the hypocrisy that this event represented. (On the JCC panel, Imam Shamsi Ali, a very soft-spoken Indonesian, called for Muslim consultants to supervise the training materials for the NYPD where terrorism is concerned). A dissident Muslim confronts the Sharia apologists. Recently, PJM sat down with professor and author Salim Mansur, whose latest book I reviewed here. In this interview, Salim describes himself as a “Muslim dissident” and he challenges all those who describe themselves as “moderate” Muslims. Unlike many “moderate” Muslims, Salim is opposed to a shariah-compliant nation and believes that religion and state must be separate in order for modernity, human rights, scientific inquiry, and democracy to flourish. He says so, below, in his own words. He also has strong words to say about immigration and Canada’s multicultural policy. Born in Calcutta, India, Salim arrived in Canada in the spring of 1974. Phyllis Chesler: Tell us about what you do. Salim Mansur: I am a professor of political science at the University of Western Ontario in London, Ontario. London is mid-way between Toronto and Detroit. I have been at Western since 1990. As you know, I have published two books: Delectable Lie: a liberal repudiation of multiculturalism (2011), and Islam’s Predicament: Perspectives of a Dissident Muslim (2009). I also write as a freelance national columnist for the Sun Media in Canada, and my weekly columns are published in the Toronto Sunand syndicated across Canada. P: You may note that I did not indicate what your religion was or currently is in my review of your book. I did not do so because the work stands on its own merit, and does not have to be framed as the work of a “Muslim dissident.” But how would you describe yourself in terms of religious identity? S: I am a Muslim by faith, a Sunni Muslim, and raised by my parents in the mainstream of the majority Hanafi madhab or school of Sunni Islam. But as many of my generation of Muslims, my parents sent me to an English middle school run by Catholic priests, and this upbringing and education taught me to be open to the world around me. P: And how about your intellectual identity? S: I am a liberal or, more precisely, I would say a classical liberal. I believe in freedom, individual freedom based on individual rights, and I view the struggle for freedom as the defining element in the making of the modern world. P: Are you, or have you been, politically active? Which political party do you support, or with which political party are you affiliated? S: I am not at present politically active. But I was for sometime, and I did stand for a parliamentary seat as an officially nominated candidate in the 2000 Canadian federal election. I was nominated by the Canadian Alliance but I did not win the seat I contested. Canadian Alliance was a center-right conservative party, and at the time of the 2000 election it was the main opposition party in Ottawa. Later the Canadian Alliance merged with the Progressive Conservatives to form the Conservative Party of Canada under the leadership of Stephen Harper, the current prime minister of Canada.